Mention of the ill-fated DeLorean project must be made in this book for two important reasons: one is that Lotus engineers were responsible for most of the design and development work on the car which went into production in Belfasts Dunmurry factory; and the other is that there were many close technical similarities in the chassis layout of the rear-engined DeLorean and the mid-engined Lotus Esprit. 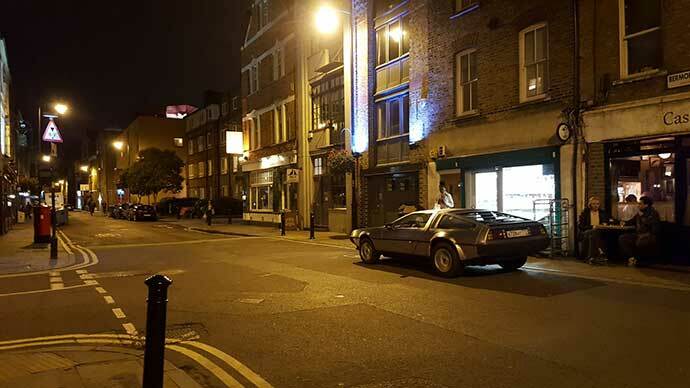 This is certainly not the place, however, to go into all the sordid commercial details surrounding the DeLorean company  which have already been published in several quarters  but merely to outline how Lotus came to be involved in the project and the part they played. John Zachary DeLorean had been one of General Motors most publicity-conscious young lions in the Sixties and early Seventies. However, he abruptly resigned from a very senior corporate position in 1973, in circumstances which have never properly been explained, and within a year he had started to think about a new car design of his own. The DeLorean Motor Company was founded in 1974, by which time the concept of a rear-engined  not mid-engined, please note  two-seater coupe had already been dreamed up. It was to have stainless-steel skin panels, but a structure which mainly consisted of composite materials some way removed from simple glassfibre; right from the start, too, it was always scheduled to have lift-up gull-wing doors. Only two production sportscars in the world  the Mercedes-Benz 3005L of the Fifties and the Bricklin SV- 1 of the Seventies had ever had such doors and neither car had sold in large numbers. At the end of 1974, DeLorean had picked Giorgetto Giugiaro and Ital Design to shape his dream car, one that would belong in car photo books worldwide, and perhaps it was at this point that his first links, however tenuous and unconscious, were made with Lotus, for the talented Italian had just finalised the styling of the Esprit. The first prototype, complete with a transversely-mounted Citroen CX four-cylinder engine and transmission, was completed in 1976, but it was found to be seriously underpowered. The second prototype of 1977 retained the same basic Ital Design body style and structure, but was equippedhe single-overhead-camshaft 90 deg V6 2.66-litre Renault 30 engine  the PRV unit also used by Peugeot and Renault  and the transmission as also fitted to the Renault 30. 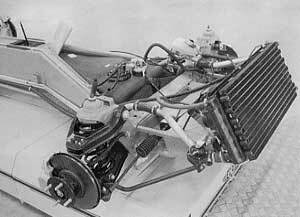 In the Renault installation, incidentally, the engine was ahead of the final drive and the transmission behind it, driving the front wheels, whereas in the DeLorean the engine was behind the final drive and the transmission in front of it; to ensure correct operation in the DeLorean it was essential for Renault to flip over the crownwheel-and-pinion set, like the Alpine-Renault A3 10 V6 installation. The project had already been dragging on for more than four years before DeLorean found anywhere to build production cars, and the state of the Renault-engined prototype could best be described as elementary. The original scheme had been to use a multi-section Elastic Reservoir Moulding (ERM) plastics monocoque, in which 0.5in thick sheets of open-cell urethane foam were sandwiched between sheets of glassfibre  and then moulded into shape under pressure in simple press tools. There were front and rear steel subframes to support suspension, engine, and transmission components, all bolted up to the plastics shell. However, even before the second prototype had been built, the ERM concept had been abandoned for the time being and pure glassfibre was used in its place. The very first designer to use a glassfibre monocoque was Colin Chapman, for the original Elite of 1957. 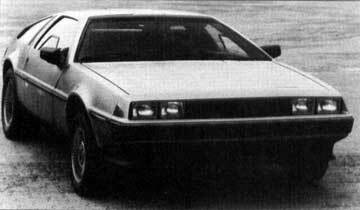 The ill-fated DeLorean coupe on which Lotus development engineers did such a magnificent job between 1978 and 1980. The companys failure was certainly nothing to do with Lotus. In 1978, John DeLoreans three major problems were to raise finance to have the car put into production, to find a production site, and to have the design refined and finalised. It is now a matter of history that he nearly settled on a site in Puerto Rico, that a site near Shannon Airport in the Republic of Ireland was also considered, but that he eventually persuaded the British Government to lend and grant many millions of pounds for the sports coupe to be built in a brand-new factory at Dunmurry, just south of Belfast, in Northern Ireland. 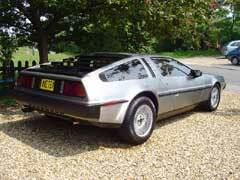 DeLorean first invited Lotus to have a look at the car during the summer of 1978, the result being that Colin Chapman and Mike Kimberley flew out to see the second prototype in Phoenix, Arizona. They have since been quoted as thinking that the car was abominable at that time, and that DeLoreans development chief, Bill Collins, agreed with them. Even so, although British Government finance for the project was agreed and made public in August 1978, Lotus were not contracted to develop the car until November of that year. For three months John DeLorean had been shopping around in Europe, particularly at Porsche, who had wanted a great deal of money and up to four years to do the job. Consequently, when Lotus agreed to do the same project for less, and in a mere 18 months, they were signed up. It was a very demanding contract, as Mike Kimberley recalls: We started with only a package  a style  and we had to provide engineering facilities  design, engineering development and prototype build. We did it under the guidance of Chuck Bennington, their Managing Director, who spent four days out of every seven at Hethel. We were given 18 months to do the job, a pace which no other company in Europe could have achieved. 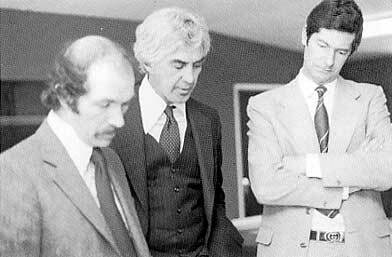 Dramatis personae  John DeLorean (centre), Mike Kimberley (right) and Lotus engineering chief Colin Spooner in discussion over the new DeLorean project. showing clearly how its design philosophy was very much that of the modern-generation Lotus cars. 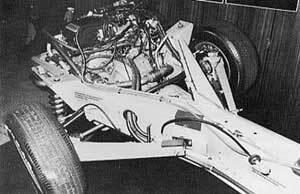 Lotus were most unhappy about it all, not merely because the prototypes roadholding and general rigidity were not helped by the big cut-outs in the shell dictated by the gull-wing doors, but also because of the safety limitations. Their own vast experience of both glassfibre-based bodies and backbone chassis-frames led them to surmise that in its original guise the DeLorean would fare very badly indeed in a barrier crash test. Very shortly Grumman  the US aerospace concern  were invited in by DeLorean to analyse the structure on their most sophisticated computers; they did so and predicted that the rear-mounted engine and gearbox would catch up with the occupants in the front footwells in a 26mph crash test! 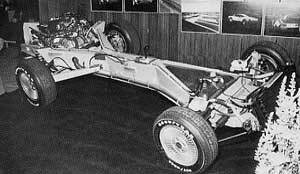 A display example of the DeLorean DMC12s production chassis, showing how the fuel tank sat between the front forks of the backbone, and the engine was hung out at the back. In many ways, including the wishbone front suspension, independent rear suspension layout and the use of Goodyear NCT Tyres, the DeLorean was close to the Esprit  but Colin Chapman would never have considered using a rear-engined layout. Before the DeLorean was ready to go into production it had virtually become a rear-engined (Renault-engined) Lotus, with a familiar type of backbone frame and independent suspension inside the Ital Design shape. Even the styling was altered, for in 1979, in mid-contract, DeLorean decided that it had been around too long and needed to be freshened up before going on sale, and he asked Ital Design to facelift everything. As Lotus were already on such a tight schedule that they had finalised the skin contours well before the rest of the car was fixed, it meant that new skins, window shapes and cut-outs had to be redrawn, and that everything abutting those profiles  which meant the composite bodyshell, trim panels, glass and many other details  had to be modified. The change, Mike Kimberley says, came 10 months into the 18-month contract and caused a considerable delay, which stretch&d the job, in the end, to 25 months. The project, which was absorbing well over half of Lotus entire strength when at its peak, would have been finished in May 1980, but was eventually wound up at the end of the year. As has already been pointed out, the sheer size of this project inevitably meant that there was delay to the development and production of Lotus new models for the Eighties, although much of this leeway was subsequently made up. The DeLorean sports coupe went on sale during 1981, but the company collapsed into bankruptcy in 1982, and this meant that the car was only ever marketed in the United States. In Federal form its PRV V6 engine had been enlarged to 2,849cc  as in the latest Volvo 76OGLE saloon, for instance  and it produced up to 130bhp. The unladen weight was only 2,8401b, which reflected great credit on the Lotus design team and their experience with such structures. It was not, however, anything like as quick as its looks suggested. Road & Tracks authoritative road test showed that the top speed was a mere 109mph  in fifth or fourth gear  that 0-60mph acceleration took a rather pedestrian 10.5sec, and that 0-100mph needed no less than 40sec and a lot of straight highway. All this helped to give the car its gutless reputation, right from the start. Day-to-day fuel consumption was quoted as 19mpg (US gallons)/22. 8mpg (Imperial gallons). 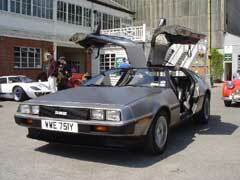 Apart from the DeLoreans rather limited performance, there was also the question of its handling. John DeLorean was once quoted as saying that the car handled better than most other sportscars and that the rear-engined layout had to be right, for that was how Porsche built the 911. Since no British journalist was allowed to test the car while it was still in production, it was not easy to find out the truth of the matter. DeLoreans in series production at the Dunmurry plant, south of Belfast, early in 1981, when hopes were high and up to 40 cars per day were being built. Everyone agreed that Lotus engineers had done a fine job, starting from a very difficult imposed design layout. The backbone chassis-frame, so like that of the Esprit in general layout, was built for DeLorean by GKN in the West Midlands, and was coated with fusion-bonded epoxy resin for anticorrosion protection. All the running-gear was neatly packaged around it, not only with the engine and transmission in the extreme tail, but with the fuel tank in the nose, between the front forks of the backbone. Front suspension by unequal-length wishbones, coil springs and an anti-rollbar, linked to rack-and-pinion steering without power-assistance  and rear suspension  by upper and lower links, a long fabricated semi-trailing arm and coil spring/damper units  were both like that latest Esprit installation. The rear engine ensured that a majority of weight would be over the back wheels  the actual bias was 35/65 per cent front-to-rear  and to tame this Lotus had provided 195/6OHR-14in tyres on 6in rims at the front, but 235/6OHR-15in tyres on 8in rims at the rear. The philosophy which went so far to making the Esprit one of the best handling cars in the world had been thoroughly applied to the DeLorean project. 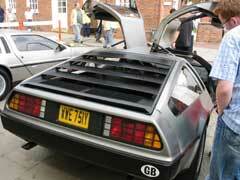 In many respects, the DeLorean was even made in the same way as the modem Lotus models. The bodyshell was built from two major mouldings by the patented Lotus VARI resin-injection method. John DeLorean had been thinking big, for there were half-a-dozen sets of mould tools  at £25,000£30,000 each  whose capacity was way above any volume that even the super-optimistic DeLorean had ever forecast. The front suspension of the DeLorean sportscar had clear historical inks with that of the Esprit, and it had the same sort of job to do. The fuel tank is low down between the front arms of the backbone frame. The failure, and most of the facts of the DeLorean business, are now well known. The car, indeed, had a short and very turbulent life. Pilot production began in December 1980  as soon as Lotus job was finished  and the first real production car rolled out on January 21, 1981. The original shipment was made to the USA in June 1981, at which point 40 cars per day were built. This rate was doubled to 80 per day in November, but by this time the cars Stateside reputation was already in trouble. Sales slumped, stocks of unsold cars piled up in both Belfast and North America, and the Receivers, Cork Gully, were appointed in February 1982. Production continued slowly and haltingly for some months, but by October it was all over. The basic reason was not only that the car, as a driving machine, was disappointing, but that it was also far too expensive at $25,000. 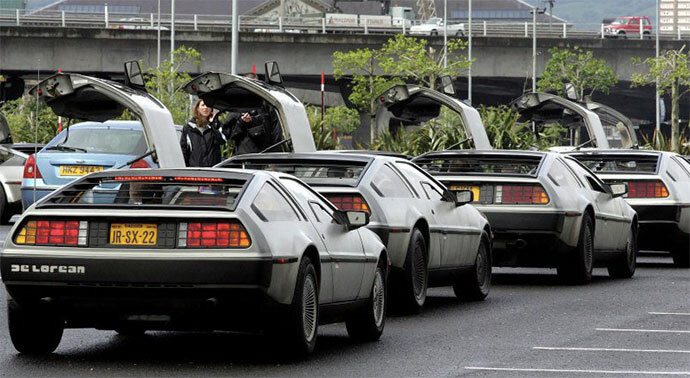 I simply do not understand how John DeLorean, with a lifetime of experience in that most down-to-earth corporation, General Motors, could ever have expected to sell 25,000 expensive DeLoreans per year which equated to up to 600 cars per week  as a result of which the financial break-even point was 10,000 car per year. The reason for the companys bankruptcy, therefore, can be spelt out in one sentence: in 23 months a mere 8,000 cars were built and at the end of the day a proportion of these cars were still unsold. 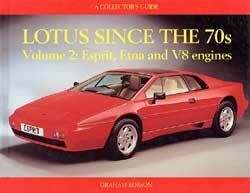 Lotus, fortunately, were paid for most of their work before the various and ever-evolving DeLorean financial scandals broke out. By that time the story of the DeLorean car was at an end. In the decade which followed, investigations revealed that there had been a colossal amount of financial chicanery. Many millions of pounds of British Government aid never reached Lotus, Colin Chapman took the secret of his share to the grave, Fred Bushell was finally tried, convicted and jailed for his part in the affair, and although John DeLorean was also indicted, he chose to stay in the USA, from where he could avoid extradition to Great Britain. 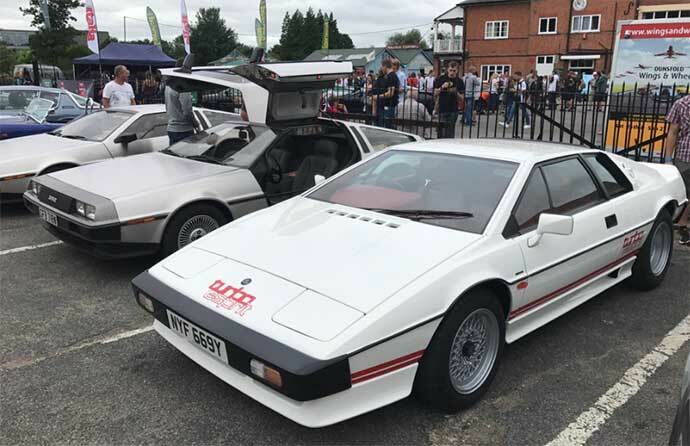 As far as classic car enthusiasts are concerned, the years have not been kind to the DMC- 12, for in the early Nineties a 10-year-old example was worth no more than, say, an Esprit Turbo of the same age, or a Europa Special of the Seventies. 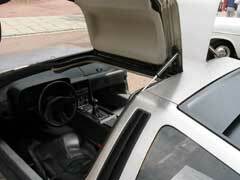 8500 DeLoreans were produced in 1981 - 82 of which at least 6000 are thought to survive. Approximately 100 - 150 cars are in the UK, though far less than that are actually driven regularly. Almost all the rest are in the US though there are perhaps another hundred or so scattered around the world. Twenty years later the cars have proved to be a lot better than people first thought and are reliable once a few upgrades have been made. They were originally intended to be a luxury 2 seater GT car (many are Autos) rather than a true sports car like the Esprit and as such they make a lot of sense. The handling is pretty good considering the rear-engined layout (helped by the Lotus input and the 235 section rear tyres) though Im sure not up to Esprit standards. They are underpowered with just 130bhp though this can be increased by removing the emissions gear. Parts supply is rarely a problem, mechanical stuff is mostly Renault while many parts can be found on other European cars of the era e.g. Jag rear brakes. 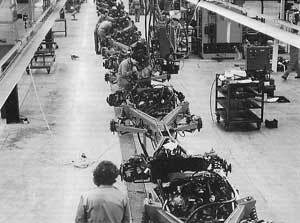 The factory had enough parts to build many more cars when they closed and these were all bought at the time and went to the US. There are two main specialists there who can supply most stuff NOS (at a price!). Some unavailable stuff has been remanufactured and the owners club is a great source of parts and info. 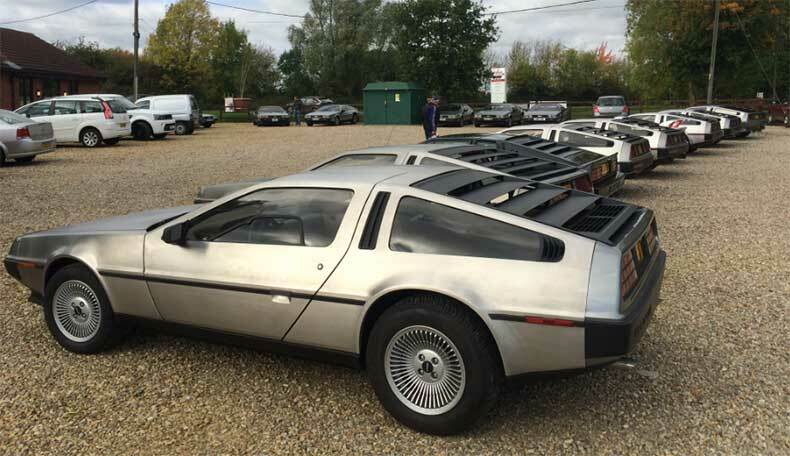 Today a good DeLorean will fetch about £15k in the UK, though theyve been known up to £25k with very low mileage and in exceptional condition. A rough one can be bought in the US for about £5k. The car park is adjacent to the DMC 'proving road', a tiny blacktop course that looks like a quarter-scale model of a typical major factory facility and too small to be called a test track, even though it includes a miniature stretch of high banking (60mph maximum please). The comings and goings of a small group of men and three sleek new cars create a kaleidoscope of greys and silvers on the tarmac. But at the centre of there changing patterns there is always one man, tall and distinguished, his sliver mane ruffling in the wind. And it is clear that this man  despite his years, despite his experience in high-powered boardrooms, despite once controlling GM product launches scaled to make DeLorean's maximum possible production look like a morning's warm up  this one man clearly has a profound case of the press introduction jitters. And well he might. On this raw morning, as a select group of American motoring journalists begin taking their first measure of the long-awaited DeLorean DMC  John Z DeLorean is feeling the essential difference between this launch and any other he has known. This isn't some anonymous Chevy or Pontiac. This is his car, with his name on it, and if it doesn't measure up, it's his sweet bacon that's on the burner. Which is why John Z pounces anxiously as each of us returns from our first experience with the car. The roads of Northern Ireland gave us plenty of opportunity to wring the DeLorean out quite thoroughly. We'd been able to check lateral adhesion on the roundabouts, passing acceleration on some of the narrow two-lane roads and top-end performance on the motorways. The countryside was amply stocked with the local species of suicidal sheep, providing more opportunities to check transient responses and braking than anyone really wanted, and there was plenty of rain to test the Goodyear NCT radial tyres (standard equipment). 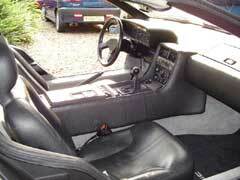 The essential consensus was that DeLorean's association with Lotus has created a car that works quite well. Although there was significant dissention  Motor Trend editor John Dianna, for example, recounted several instances of finding himself 'in places I didn't want to be' when exploring the limit of adhesion the DMC does seem to be free of the terminal oversteer expected with the35/65 rear weight bias. The DeLorean/Lotus brainstrust sought to remove this trait from the mix by using extra-wide (235/60HR 15) rear tyres and they seem to have been successful. The car sticks amazingly well and exhibits moderate understeer in most corners. When the driver does provoke some rear-end drift, the effect is progressive rather than the tail trying to beat the nose to the bend. Altogether, is seems surprisingly forgiving, particularly for a rear-engined design. The weight bias pays off in the steering, where the relatively quick (3.2 turns lock-to-lock) rack and pinion steering requires no power assistance, which makes for excellent road feel. Braking  with power-assisted discs all round  is first-rate. A couple of the test cars had an initial tendency to slew this way or that under brakes, but after a few miles the pads bedded-in and worked very well. Had they not, there are at least two sheep who would now be munching in the great pasture in the sky. The NCTs, as you might expect, do an excellent job of transmitting all that braking power to the road without the wheels locking up. Predictably, when lockup does occur it's at the front wheels first  not particularly desirable, but thankfully, difficult to provoke. We were able to drive cars with five-speed manual and three-speed automatic transmissions, both units supplied by Renault and both satisfactory. The throws on the five-speed are gratifyingly short, but not everybody will like the height of the gear lever, which sits atop a substantial cowling covering the massive backbone frame. It also seems to little too easy to overwhelm the synchromesh, but there is some trade-off in the pedal layout which makes child's play of any heel and toeing action. The engine is, of course, a Peugeot/Renault/Volvo V6, in Volvo 2.85 litre Bosche K-Jetronic fuel injection trim. This generates 135bhp at 5500rpm  sufficient, according to DeLorean, to propel the 2700lb car from 0 to 60mph in 8.5 sec, but our informal timing efforts never quite duplicated that. The car's gearing is quite high  fifth is a well-overdriven 0.821 to one and the final drive is 3.44 to one  which takes a chunk out of acceleration for the sake of mpg (Federal EPA ratings for the five-speed are 19mpg city, 29 highway, with the automatic at 24.5 in the highway cycle) and for the sake of long legs on the open road. The DMC is this low-tuned US form will just reach 125mph, but getting there takes patience. The PRV engine, which has the great virtue of being a proven power plant, is a smooth performer overall and reasonably pleasant to live with. A certain amount of noise finds its way through the bulkhead separating the passenger compartment from the engine bay, but this becomes unobtrusive after the first few minutes. It would be pleasing if the exhaust note possessed a little more sporting authority, but then they're tuning a car not a calliope. For ride, the DMC scores well. The all-independent suspension is clearly set for sporting feel and performance, but the spring and damping rate provides ride quality favourably comparable with, say, a Porsche 928, fat NCT tyres and all. There seems to be a substantial amount of wind noise, some from the door edges but most from those small domi-windows in the main door windows. The small windows can be lowered  the main windows are fixed, one of several penalties the DMC has paid for its dramatic gullwing doors  but they aren't a particularly endearing feature. With miles, the interior layout remains good, albeit snug, legroom is plentiful  after all, this is a car conceived by a man 6ft 4in tall  and headroom under the gullwing doors is good, thanks to an indentation in each door directly over the occupants' heads. The padded three-spoke steering wheel affords a good straight ahead view of the instrument panel, which is comprehensive and legible. 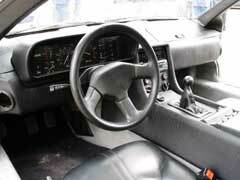 DeLorean use a combination turn/signal/horn control, and all the other controls are reasonably accessible. Thanks to the extensive use of leather and the excellence of the seating design, the interior produces an initial impression of high quality, an impression of high quality, an impression that is reinforced when one actually snuggles down into the driver's seat. Pull the gullwing doors down  a lanyard is attached to the handle, to make the reach easier  and you have a sense of being ready for some sort of adventure like a dash across the countryside. Unfortunately, you also have a strong sense of limited visibility, particularly if your first driving move involves reversing. Then you're immediately thankful for even the limited help afforded by the twin electric remote control outside mirrors. John DeLorean regards the mirrors as an unnecessary foo-foo touch installed against his objections  which makes it a likely bet that he's never had to use the DMC's reverse gear for more than about 3ft. Opening your door helps relieve the rearward blindness somewhat but creates opportunities for other problems like snagging the door on tree limbs or other overhead hazards. It goes almost without saying, of course, that the gullwing doors are a distinctive feature of the DMC's Giugiaro-designed body. But they have also been a source of limitless headaches to the men delegated to get them into production. Fabrication of 'hard' or permanent tooling for the doors which are exceedingly complex compared with the rest of the car, was not completed when we visited Dunmurry. That meant that the assembly teams had subtle variations from one door to the next. DeLorean is very fortunate to have two first-rate professionals whipping his factory into shape. George Broomfield, a veteran of 26 years with General Motors, is the head of manufacturing operations. During those 26 years, he started two factories up from scratch  GM's engine plant in Brazil and a truck plant in Argentina  and it is doubtful that Dunmurry would have gotten past square one without him. He is ably seconded by Aston Martin veteran Mike Loasby, a brainy and quick-witted engineer whose enthusiastic car expertise meshes nicely with Broomfield's vast store of manufacturing know-how. The real challenge facing these two men and their various lieutenants in the factory is training a totally green workforce. Depressed Belfast has produced waves of eager, able-bodied applicants  which is precisely why the British Government are backing John Z's efforts  but there is very little in the way of translatable work experience. And when it comes to building cars, particularly cars that are going to sell for high price, there is simply no substitute for experience and expertise. This fact was dramatised by the US journalists' vehicles, which were drawn from among the first 50 DeLoreans to leave the line. They were earmarked for press testing early on, even though some 400 more cars had been completed by the time we arrived in Dunmerry, and we couldn't help feeling that this was a remarkable action by the DeLorean management. Without quoting a laundry list of faults, each of the preview cars had various minor flaws of one sort or another, most of them having to do with trim pieces coming loose and the like. We encountered one serious door leak, another door that suddenly decided if didn't want to open and an electric window lift that didn't. Just the sort of problems you'd expect from early production cars in a brand-new factory. As far as the test cars' exteriors were concerned, there isn't too much that can go wrong with stainless steel body panels. At least Broomfield, Loasby and associates didn't have to add orange peeled paint to their list of fit and finish problems. And the cars' looks speak for themselves. The Northern Irish are tremendously proud of the DMC and we drew crowds almost everywhere we stopped. It's hard to imagine any car enthusiast anywhere in the world not supporting the DeLorean dream. And the initial impression of it is basically favourable: the DMC handles better than expected and offers potential buyers a package that is unquestionably distinctive. All-in-all, the DMC clutch of seasoned industry pros and inexperienced but enthusiastic workers have done a remarkable thing. They've gone from pasture of production  production that employs some novel techniques, like fabrication of the plastic sub-bodies  in about two years, and instilling experience in a new manufacturing crew isn't at all like injecting resin in a GRP mould. It takes a lot of practice  and before anyone makes any real bottom line conclusions about the DeLorean they should wait for a car that's had the benefit of that practice period. We came across this amazing shot and though it was too good not to add to this page. We're don't have an details of where or when and if it was set-up or just there. 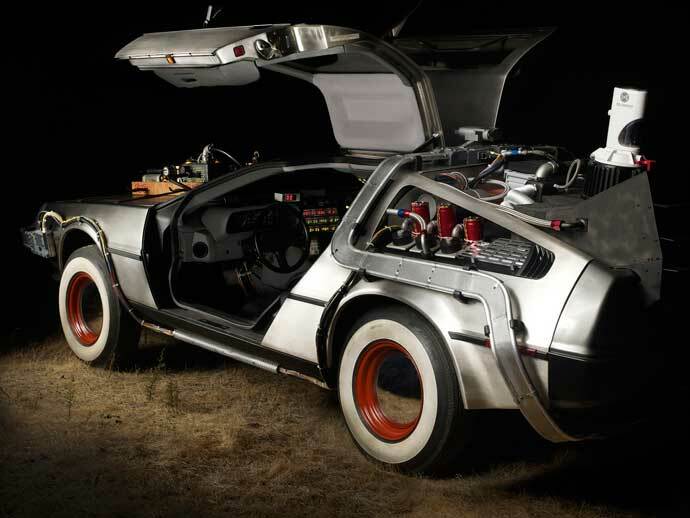 Jay joins "Back to the Future" Creator Bob Gale, and Restorers Terry Matalas and Joe Walser to go in-depth with one of the most iconic movie cars of all time in this incredibly detailed recreation of the DeLorean time machine. The original DeLorean factory in Northern Ireland may be long gone but you can still buy a factory fresh example of the most iconic gull-winged doored car of all time. XCAR went to Houston to find out more. What happens when you throw a very large and power Grand National motor into a 30 year old legend like the DeLorean? Thats what Matt Farah finds out on this week's episode of TUNED. Happy to announce that the DeLorean film is close to being released. We will have the festival premiere at the Tribeca FF in NYC end of April, and the film is slated for release June 7th. Please take a look at the two announcements below that feature the film's trailer (there are a lot more articles on the internet if you search for the title of the film). Thank you again for your help and participation in this project that has spanned well over 15 years for me. I look forward to keeping you up to date over the next 3 months on the release plans.